VegNews Senior Editor Richard Bowie spotlights his five favorite veganizable dishes for a Mexican Christmas feast. Christmas is about being surrounded by family and friends, giving gifts to show your love, and spreading holiday cheer to all. But make no mistake, it’s also about food. This Christmas Eve, I’ll head to San Bernardino to celebrate with my family, and despite my non-ethnic, Ziggy Stardust-inspired last name, it will be a feliz Navidad. Christmases past saw me enjoying steaming bowls of hominy-loaded menudo, giant mugs of chocolatey champurrado, crispy-sweet cinnamon bunuelos, and, of course, the much-revered, maíz-based tamales. But after going vegan, and having to settle for a couple sad trays of my local health food store’s grab-and-go mac and cheese, I finally feel confident enough in my abilities to wow my tios and tias with some seriously good Mexican Christmas food. Here’s what I’m planning. As far as soups go, in my family at least, menudo is king. Growing up, I would fish for the puffed up, lime-treated corn kernels called hominy, drink up the deliciously spicy red broth, and completely avoid the gross, chewy strips of tripe (cow’s stomach). But now, as a vegan, I know of some great plant-based substitutions. Different veganized recipes call for various types of mushrooms, strips of yuba, or even tofu to replicate the chewiness of tripe, but the most authentic recipe I’ve managed to find—by Los Angeles-based Chicano blogger Chanfles—utilizes textured vegetable protein. 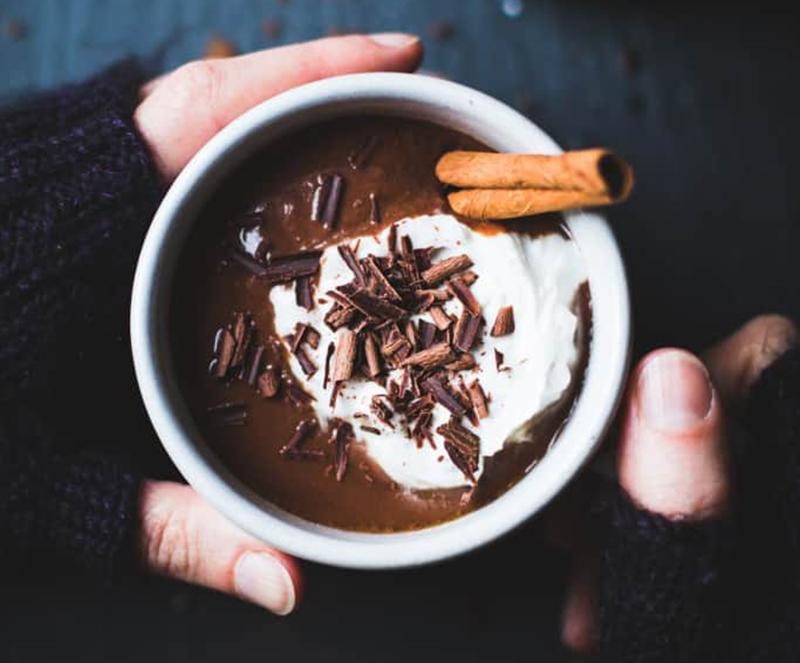 If warming up with a comforting mug of hot chocolate is your idea of a good time, then be prepared to fall in love with champurrado. Enjoyed by the Aztecs long before cattle were ever brought to America, this beverage was originally prepared dairy-free and vegan—using water as the base. Over time, milk found its way into modern recipes shared by many families, but you can easily get back to the basics or use cashew or pecan milk (a nod to the native nuts of Mexico) for an even creamier experience. Essential ingredients include piloncillo—raw whole cane sugar, Mexican dark chocolate, cashew milk, cinnamon, vanilla, anise seed, and masa harina, a lime-treated corn flour that creates a deliciously thick texture. The Bojon Gourmet also makes a beautiful coconut cream-topped version that’s sure to please. If you search for the recipe of this treat by name, you’ll probably see photos of small doughnut hole-looking desserts. Forget those. Those are closer to the kind of bunuelos Spaniards brought along to the Americas. What you want are the thin, flat, crispy bunuelos of Mexico. An easy dough made from flour, sugar, shortening, and baking powder is flattened, fried, and coated in cinnamon sugar. It’s a simple recipe (made simpler if you just use tortillas), but it’s one that you can make especially your own by adding orange zest to your sugar mixture, serving with dairy-free vanilla ice cream, or drizzled with an anise-infused piloncillo syrup. Many Mexican families hold their big get-togethers on Christmas Eve, sleep late the next morning, and enjoy a more casual, quiet Christmas Day together, a tradition I especially loved as a child because it meant I could open presents hours earlier. Now, the same is still basically true—two days of festivities means two different opportunities for comida. But another reason Christmas Eve rules is because of ensalada de Nochebuena, or, literally, Christmas Eve salad. This staple is a delicious jumble of ingredients that serves as an intensely colorful, cool, and fresh way to cut the richness of a holiday feast—plus, it’s already vegan! Navel oranges, apples, sweetened beets, jicama, radishes, grapefruit, pineapple, banana, pomegranate, pepitas, cilantro, lime, pepper, vinegar, and peanuts are all tossed together with romaine lettuce for a showstopper of a salad. A simple vinaigrette made from the cooking liquid of the beets can be whipped up quickly, or you can combine vegan sour cream or yogurt, sugar, beet juice, and salt and pepper for a creamier dressing. 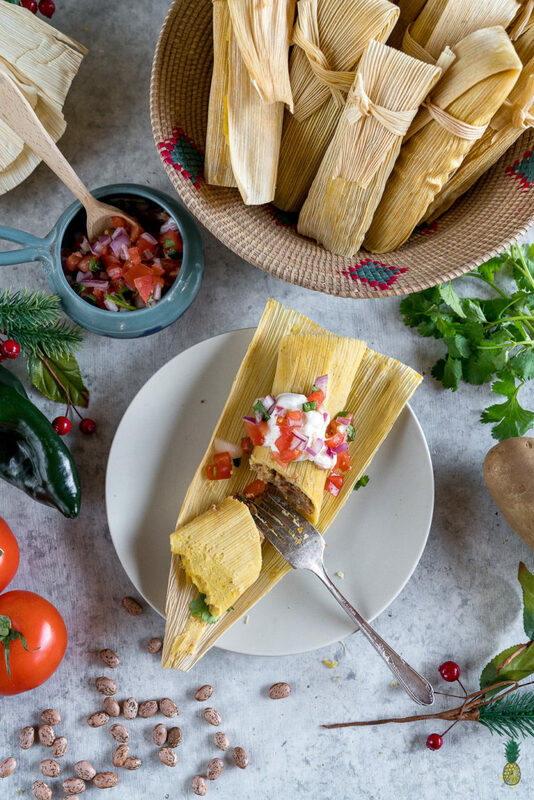 For tamales, a dough is made from masa harina, a little oil or vegetable shortening, and seasoning, then spread into dried corn husks that’ve been soaked and re-hydrated, are filled with a delicious mixture of your choosing, rolled up, and steamed. It’s a notoriously involved, all-day process to make enough tamales for a big celebration (I alone could put away four or five in one sitting), but a small vegan batch is much more manageable. However, the big question remains: what to fill them with? Roasted potatoes, sweet potatoes, pinto beans, black beans, squash, tofu, jackfruit, corn, zucchini, poblano peppers, salsa, vegan cheese, soyrizo, vegan chicken—they all work.